Six properties have now been built on the former Blackwell Hotel site which, in recent years, has been an eyesore for local residents. 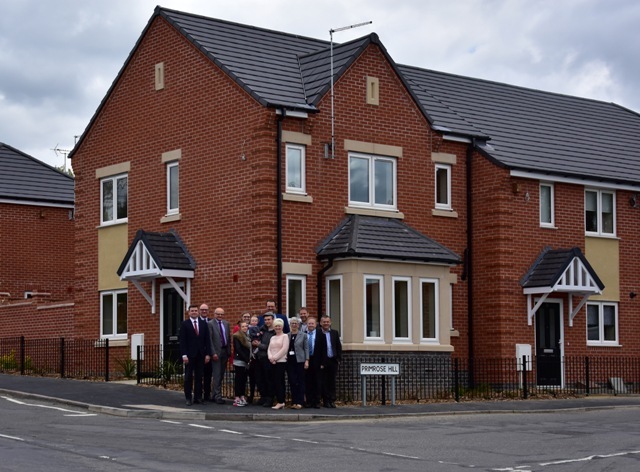 The development is the second to be progressed through the B@Home programme, which was procured through EEM Ltd. It’s a multi-million pound investment in new housing for us as we are working in partnership with Robert Woodhead Ltd over a four-year period. The programme aims to deliver an anticipated 150 high quality, energy efficient homes, which will address local housing needs across the District. 13 properties have been built so far, with another eight on Fir Close in Shirebrook nearing completion and work is starting on a further 49 this year. Built on the derelict site of the former Blackwell Hotel, the new development boasts five 2 bedroom houses and a 2 bedroom bungalow on the corner of Primrose Hill and Alfreton Road. Work on the site began early last summer and was completed mid-April. Due to high demand, all of the properties were tenanted and occupied within one week of completion. Cabinet Member for Housing, Councillor John Ritchie said, “This second stage development of council homes in our district is another step forward to achieving our goal of around 150 homes over four years. “It’s not just about housing, 9 work experience students from Tibshelf Community School have worked on this Blackwell development. “These students were studying for the WJEC Level 1 First Award in Construction in The Built Environment and have gained valuable first-hand experience on this site, also with 94% of subcontractor spend being within 40 miles of site, we are proving that we are delivering both social and economic benefits to our district. Glenn Slater, Business Development Director at Robert Woodhead Ltd, said: “The B@Home partnership aims to create a positive impact on the District, not just by building new homes for local families, but in providing a wide range of work experience, training and job opportunities. Rebecca Dermody, Head of Operations for EEM Ltd, said: “We always aim to develop frameworks which help our members achieve the best value, in addition to offering wider community benefits.